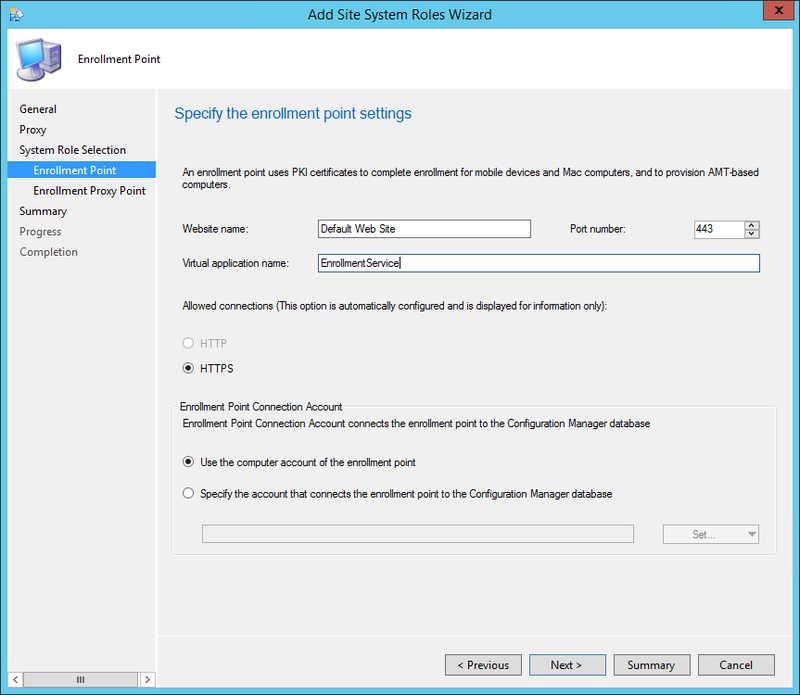 In this part of SCCM 2012 and SCCM 1511 blog series, we will describe how to install SCCM 2012 or SCCM 1511 Enrollment Point and Enrollment Proxy Point site system roles. The Enrollment Point uses PKI certificates for Configuration Manager to enroll mobile devices, Mac computers and to provision Intel AMT-based computers. 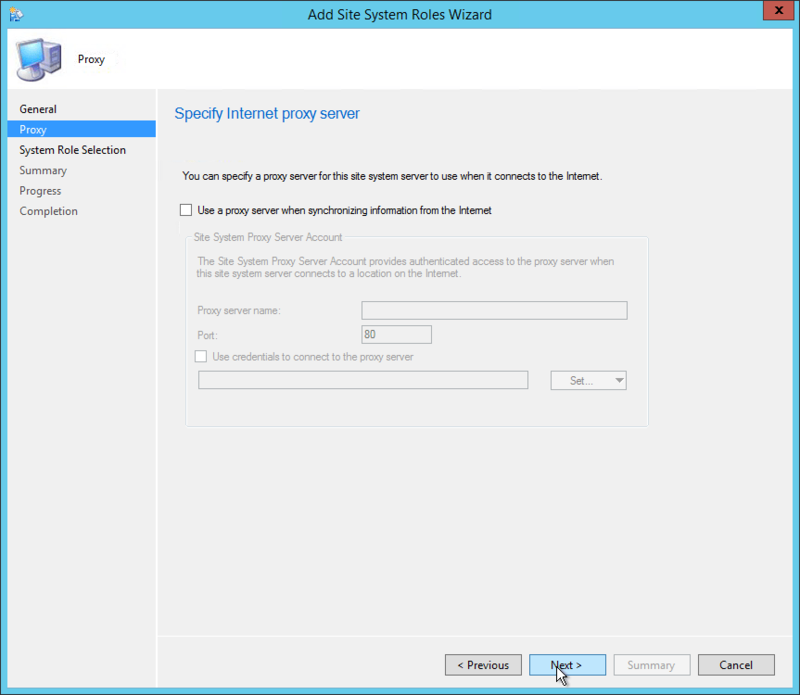 The Enrollment Proxy Point manages Configuration Manager enrollment requests from mobile devices and Mac computers. This is not a mandatory site system but you need both Enrollment Point and Enrollment Proxy Point if you want to enroll legacy mobile devices, Mac computers and to provision Intel AMT-based computers. Since modern mobile devices are mostly managed using Windows Intune, this post will focus mainly on Mac computers enrollment. 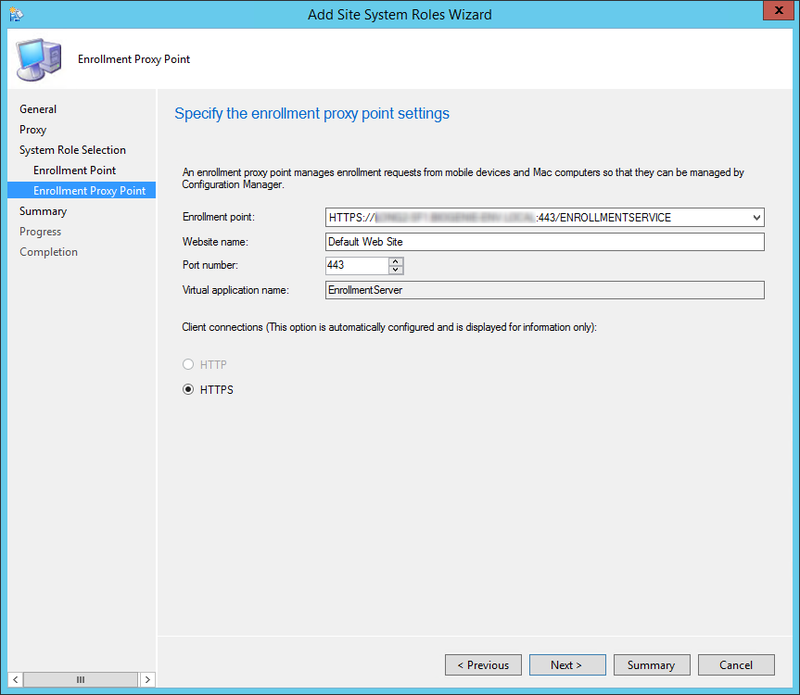 The SCCM 2012 Enrollment Point and Enrollment Proxy Point are site-wide options. It’s supported to install those roles on a stand-alone or child Primary site. It’s not supported to install it on a Central Administration site or Secondary site. 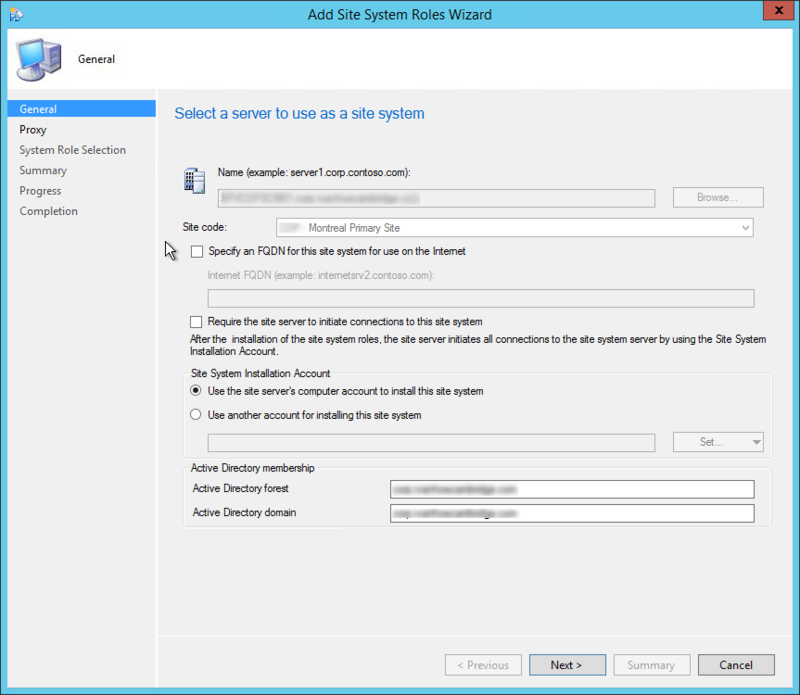 You must install an SCCM 2012 Enrollment Point in the user’s forest so that the user can be authenticated if a user enrolls mobile devices by using SCCM and their Active Directory account is in a forest that is untrusted by the site server’s forest. 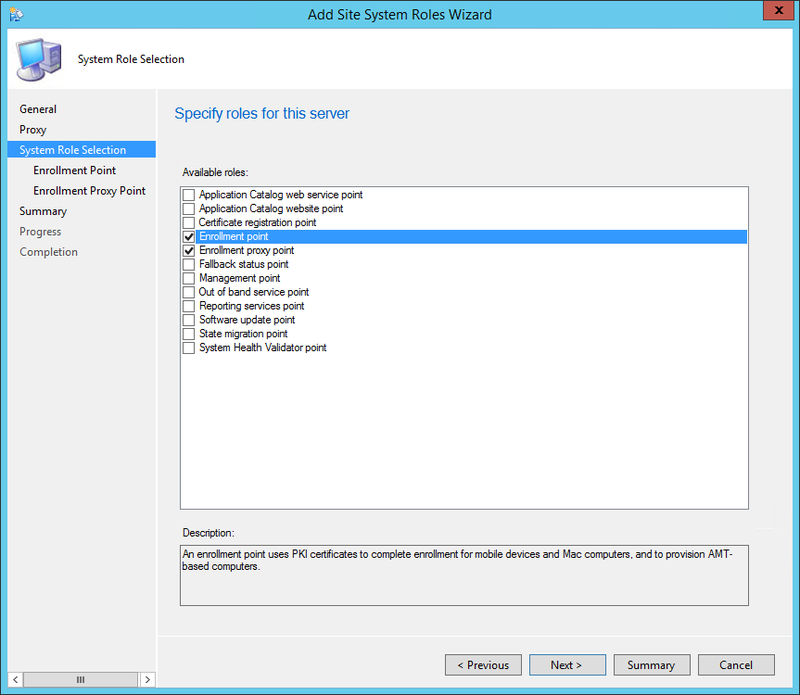 Beginning with System Center 2012 Configuration Manager SP2, the computer that hosts the SCCM 2012 Enrollment Point or Enrollment Proxy Point site system role must have a minimum of 5% of the computers available memory free to enable the site system role to process requests. When those site system role are co-located with another site system role that has this same requirement, this memory requirement for the computer does not increase, but remains at a minimum of 5%. For this post we will be installing both roles on a stand-alone Primary site using HTTPS connections. If you split the roles between different machine, do the installation section twice, once for the first site system (selecting Enrollment Point during role selection) and a second time on the other site system (selecting Enrollment Proxy Point during role selection). Enter the port number you want to use. The HTTPS setting is automatically selected and requires a PKI certificate on the server for server authentication to the Enrollment Proxy Point and for encryption of data over SSL. For more information about the certificate requirements, see PKI Certificate Requirements for Configuration Manager. 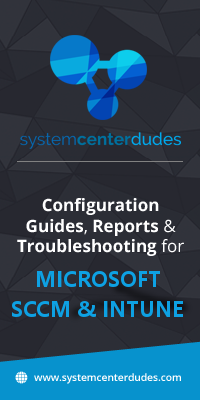 Thanks for all the great guides, they have really helped me to get SCCM up and running reliably, and to understand how it’s all coneected. Regarding the set up of enrollment – I have a bit of an issue when installing the point and proxy. It seems like each time I install these roles, it also configures the 8530 port in IIS against the default web site. Unfortunately, this port is already used by the WSUS administration site after installing the software update point role (after post installation tasks have completed). 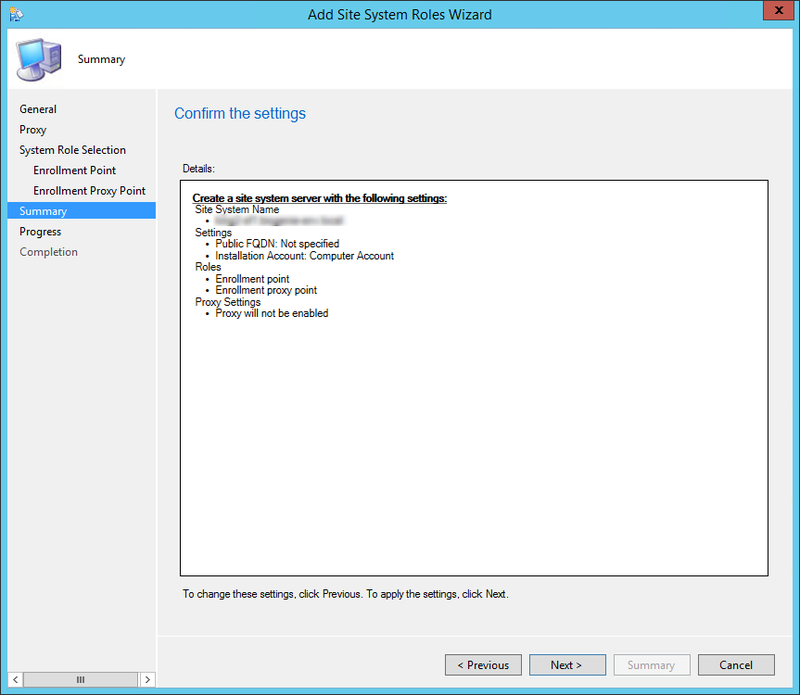 I have tried going back to the point of removing IIS server role and WSUS and reinstalling everything from there, but it still insists on setting up two separate sites with conflicting port 8530. If I disable 8530 on the default site, WSUS pops back to life, but then enrollment is broken. I see that this is set up as a separate site, so I guess I need to clarify if SCCM uses just one site with all the ports (80,443,8530 and 8531) configured, or should “WSUS Administration” and “Default Web Site” coexist, but with their own ports for each?